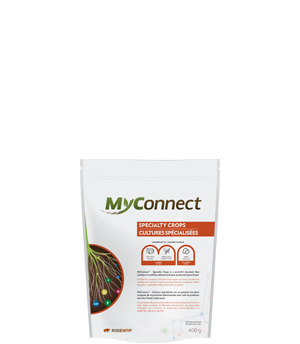 MyConnect® – Specialty Crops is a powerful bio-fertilizer that consists of highly concentrated, carefully selected and pure-produced mycorrhiza. 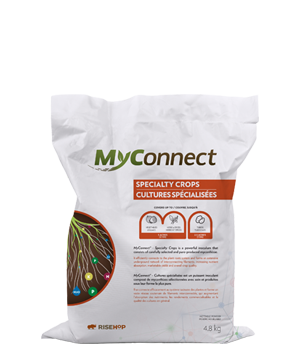 It efficiently connects to the plant-roots system and forms an extensive underground network of interconnecting filaments, increasing nutrient absorption, marketable yields, stress resistance (drought) and overall crop nutritional quality and flavour. * For tubers, product quantity must be doubled to cover the same area as shown below. 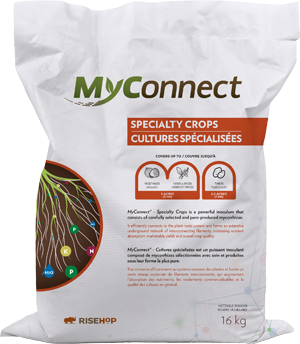 Seed treatment: Homogeneously mix the amount of product necessary to evenly coat the number of seeds required for one hectare (2.5 acres) of cultivation area. Generally, 2 to 3 cups of products are needed. 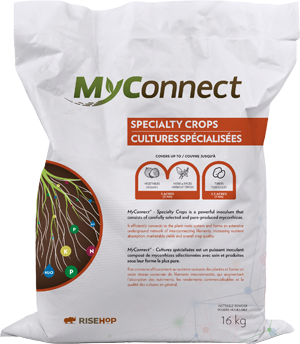 *In-furrow application at planting: Dilute the content of the bag in the volume of water required for 1 ha (2.5 acres) of seed pieces (40-95 L). Agitate well during the dilution and just prior to application. Apply directly on seed pieces in-furrow. Cuttings and bulb treatment: Homogeneously mix the amount of product necessary to evenly coat the number of cuttings/bulbs required for one hectare (2.5 acres) of cultivation area. Generally, 2 to 3 cups of products are needed. 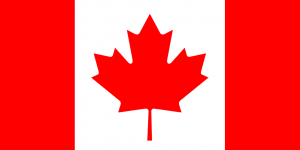 Incorporation in transplant water: Dilute 250 ml (1 cup) of product in 50 L (13 US gallons) of room temperature water, while mixing. Remove filters and use nozzles with a minimum of 2 mm (10 mesh) openings to avoid clogging. Apply 5 ml (1 tsp) of diluted product per plant, directly to the root system or on the side/bottom of the planting hole. Agitate the diluted product frequently while spraying. One cup of product is enough to treat up to 10,000 plants. Seed piece treatment: Evenly mix the powder content of the bag to coat the amount of seed pieces required for 1 ha of seedbed prior to planting.